He isn't good at school, or talking to people, or making friends. He's been in six different foster homes, and he can't really remember his parents. It seems like he'll never have anything all his own. Then he finds an owl egg. With the help of Mab, the skinny "girl genius" of his class, he names it King Arthur and sets out to hatch and raise an owl of his very own. As they wait for King Arthur to hatch and as they raise the funny-looking owl chick, Mab and David become true friends. But Mab's father thinks they should return King Arthur to the wild. Can David give up his owl? Is it even the right thing to do? What can David do if the worst thing of all happens? This is just the type of fiction one would expect from Hayden, usually a nonfiction scribe. this is a well-wrought problem novel for the younger set. A book for everyone who has ever been a child. As a classroom teacher, I am always looking for those books which draw students in, creating a world in which we, as a class, can enter. 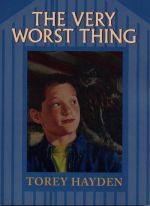 The Very Worst Thing is one of the best books I have used in my classroom. 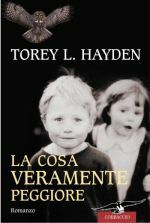 Torey Hayden confronts issues which our children face but often have difficulty articulating. The Very Worst Thing prompted discussions about bullying, standing up for what you believe, family, foster care, love, friendship, and keeping wild animals in captivity. Each afternoon after I read, my students would beg me to, "read another chapter." My students identified with David and I continue to hear, "remember what David did..." as my students relate their lives to The Very Worst Thing. We invited a wildlife expert to our classroom, and he was impressed with my students' knowledge, which came from their experience with this book. If you are the kind of teacher who enjoys real-life novels which inspire, challenge and open dialogue, you will find a gem in The Very Worst Thing. I did! I liked this book because it talked about real problems kids my age face . . . and Id like to have an owl too. THE VERY WORST THING is actually the book Torey intended to start her writing career with. She conceived of the idea for the book when she was in her early twenties and drafted out the plotline, but she couldn't think of a way to start it. So she put the papers away and did not return to the idea for almost thirty years! When she was at university as an undergraduate studying biology, Torey hatched and raised a short-eared owl after its mother was killed on the road and King Arthur is based on this experience. 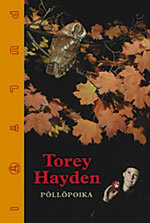 Torey has enjoyed the opportunity to write for children very much and hopes to write other books in the future. She'd most like to write a very different kind of book, however - a fantasy about time travelling!